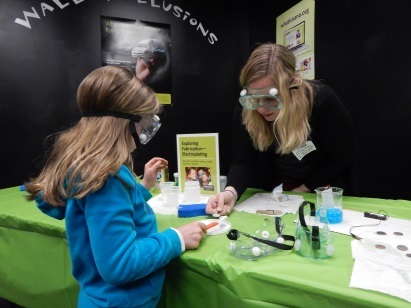 As a recipient of the 2014 NanoDays kit from NISE Net (Nanoscale Informal Science Education Network), the MRSEC organized and hosted three events with the Discovery Space of Central PA, Materials Research Institute (MRI), Center for Nanotechnology Education and Utilization (CNEU), and Center for Science and the Schools (CSATS). At a weekly research Café held at MRI, ~80 graduate students and faculty heard the personal stories of two MRSEC graduate students who used outreach to share their own research, and the benefits they’ve gained in the process. NISE Net activities were presented at stations before and after the discussion. museum. A total of 136 visitors attended. 24 Pennsylvania upper elementary, middle school, and high school educators learned about nanoscale science and technology via a one-day workshop. Activities included faculty presentations, a tour of Penn State’s materials characterization and fabrication facilities, exploration of NISE Net activities with graduate students, remote access and control of a scanning electron microscope (SEM), an inquiry-based classroom-ready lesson titled “Hydrophobicity: The Lotus Leaf”, and information about post-secondary education and career opportunities in nano-related fields.